So close to the big day! Pretty sure we can almost smell the roast dinners and hear the wrapping paper being torn to bits. Exciting! Phew! Was an amazing, exciting, exhausting and… well… any other ing word few months it’s been! Thank you sooooo much for each and everyone one of you who has placed an order, browsed the website or even just kept in touch on social media. You guys are the best and make us smile every single day. To keep you in the loop of when we will be in to answer any questions or comments, below are our opening times and days so you know when you can catch us. We’ll also be on our social pages as much as possible so any emergencies just try us there and we’ll find you. 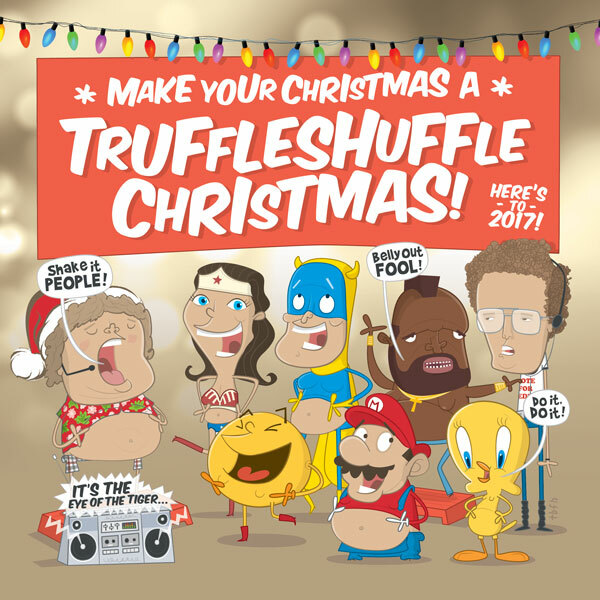 We’ll be back in work 9am Wednesday 28th December to answer any of your urgent questions – otherwise, please just pop us an email at help@truffleshuffle.co.uk and we’ll get back to you ASAP. Previous PostPrevious The Weekly Retro Movie Rundown… Crimbo Special! Next PostNext Time to Treat Yo’self… Sale – Up to 65% off!